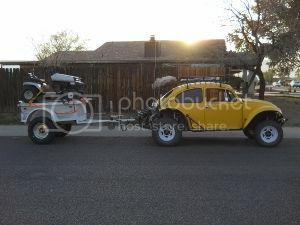 AzBaja.com, Home of the VW Baja Bug -:- Baja Forums -:- Off-Road & VW Based Clubs (4x4, ATV, Jeep, Motorcycle) -:- Events and Get Togethers World Wide -:- July 4th campout in flagstaff. Baja Forums -:- Off-Road & VW Based Clubs (4x4, ATV, Jeep, Motorcycle) -:- Events and Get Togethers World Wide -:- July 4th campout in flagstaff. July 4th campout in flagstaff. Post subject: July 4th campout in flagstaff. On July 4, we’re going back to Fort Tuthill Campground July 4 – July 8.Try to reserve your campsite as soon as possible and remember you might need to bring a jacket. Dawn and I scoped out the camp ground and we moved our camp spot to D-4 it has a better view than A-5. The Flagstaff off-roading is very light with not any real big challenges, but a street legal vehicle is required to get to the dirt.All vehicles are welcome on this outing. Well the votes are in -- it looks like we are going to Fort Tuthill Campground for Memorial Day weekend and for the 4th of July weekend in the cool pines of Flagstaff. Satellite tv is spotty in this campground due to all the trees. We have found only a few campsites in Flagstaff that have shade and good satellite reception. I went online and reserved my campsite, I am in spot D-4 on both Memorial Day and the 4th of July. If you have a super coach you may want to recon this campsite. If you have anything 25ft or smaller I don't think you will have a problem anywhere else. I have a 41ft class A and I have stayed in A-7 in the past with no issues parking. I have also stayed in F-11 and G-7 but it kinda tough to get into but with a portable dish you can get Satellite. I am sure that the campsites are filling up fast. I would go online and reserve your site as soon as possible, this is not a very big campground but seems to be very popular. They have just recently lost the use of their overflow camping area. They have a brand new reservation system that is not working properly, if you are unable to get a printout of your reservation you will need to call and they will put you in manually. Dawn and I are familiar with this area and off-roading is easy and beautiful, but you do need to be street legal. Let me know when you make your reservations and what campsite you are in. Fort Tuthill Campground -if there are fire restrictions that weekend I beleve we can still have fires there you can get a campsite for $16. a night. May 26th - 28th AVC campout ???? July 4th AVC campout ???? I am takeing off July 4th - July 8th going North! Oct 20th - 21th AVC Crown King campout. Dec 29th - Jan 1st AVC Campout in Wickenburg. See you in the dirt. Events and Get Togethers World Wide Flagstaff???? [ Go to page: 1,	2	] 17 Dalton 9633 Flagstaff??? ?